Many years ago, long before the Internet era, my dear college friend Alma sent me an important letter. I could feel her excitement for the little surprise she was sending in that letter. It had two recipes, one for the famous sweet bread (“conchas”), and the other for the bolillos. She described how she spent an entire Saturday at her neighborhood bakery learning how to make them and wanted to share the recipes with me, knowing how much I enjoyed cooking. At the beginning when I started to work with this recipe my bread was a mess, but throughout the years, with practice and tweaking the recipes, I finally have bread that resembles the one sold in Mexico. I still have to keep practicing with it, since it’s not that easy to make a bread exactly like those sold in bakeries in a home oven without the commercial flours and enhancers, but the texture, smell, and even the crunchy sound is there. 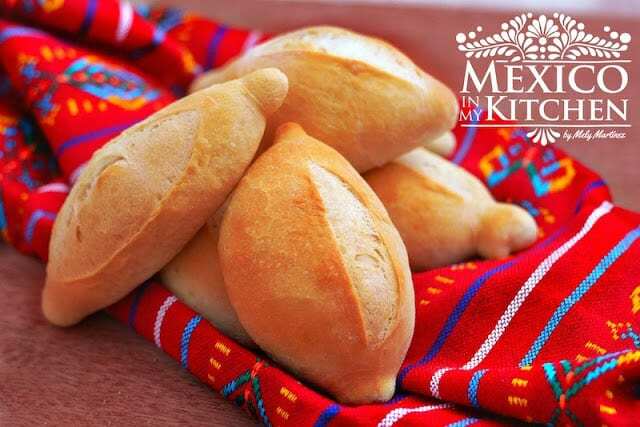 This bread is also known as “Pan Francés”; the French baguette recipe was transformed in Mexico and became ours as the “bolillo”. It is also known as “Birote” and “pan blanco” in some areas of the country. It is very common in my hometown to have this bread sliced and toasted in the griddle/comal with butter. Every Sunday we have coffee with bread and butter in our home, sometimes even in bed. In a large bowl or your heavy-duty mixer, place the starter, flour, salt, yeast, and melted shortening. Start kneading the dough, adding the warm water slowly right at the beginning of the kneading process. Remove dough from the bowl and place on your working surface to form a ball. Grease a large bowl with shortening, oil or PAM spray. Place the dough and turn it all over to make sure all sides are covered with a coating of the grease. Cover with a plastic wrap and let it rest in a warm place for 2 to 3 hours. After the dough has doubled in volume, gently push your fist in to deflate it. Divide the dough into 10 pieces. To form the bolillos-rolls, dust your work surface with flour very lightly, flatten one piece of dough with the palm of your hand and fold 1/3 of the dough towards you and press down with your fingers, sealing it very well. Fold the dough again, repeating the sealing process until you form a roll, pinching the dough tightly. Make sure all the ends are sealed. To shape the rolls, place your hands over the dough and press gently but firmly, cupping your fingers, rolling back and forth. Place each bolillo/roll seam side down on the greased baking sheet and cover with a greased plastic. LINK to baguette pan. Once the rolls have doubled in volume, and just before placing them inside the oven, make a deep cut using a sharp serrated knife or a razor blade. Spray the rolls with warm water, place them in a preheated oven and add 1 1/2 cup of cold water to the metallic tray you placed on the oven floor. The steam will create that beautiful thin and crunchy crust. 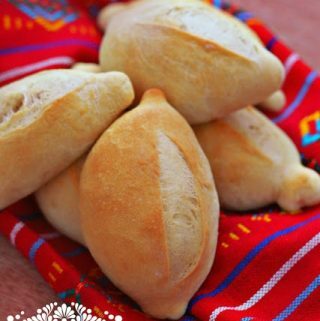 This bread is also known as “Pan Francés”; the French baguette recipe was transformed in Mexico and became ours as the “bolillo”. It is also known as “Birote” and “pan blanco” in some areas of the country. It is very common in my hometown to have this bread sliced. FOR THE STARTER: The night before baking, place yeast and water in a small bowl, mix well and add the flour. Mix again. You don’t need to knead here. Cover with a plastic wrap and let sit on your kitchen counter top all night or at least 8 hours. Making this starter will increase the flavor of your bread. The next morning the starter will have a larger volume and will have formed lots of bubbles. BAKING DAY. In a large bowl or your heavy-duty mixer, place the starter, flour, salt, yeast and melted shortening. Start kneading the dough, adding the warm water slowly right at the beginning of the kneading process. IMPORTANT: If you live in a very humid place, you will need to reduce the amount of water by about 2 tablespoons less than indicated. If using a mixer, knead for 7 minutes on speed 2; if kneading by hand, knead the dough for about 15 minutes. The dough will separate from your mixing bowl like it shows in the above picture while kneading. Grease a large bowl with shortening, oil or PAM spray. Place the dough and turn it all over to make sure all sides are covered with a coating of the grease. Cover with a plastic wrap and let it rest in a warm place for 2 to 3 hours or until the dough has doubled in volume. If you live in a warm and humid weather this step will take less time. After the dough has doubled in volume, gently push your fist in to deflate it. Divide the dough into 10 pieces. (About 110 grams each). Place the pieces of dough into your slightly greased working surface and cover with a greased plastic wrap and let them rest for 15 minutes to allow the gluten to develop and help to shape your bollillos/rolls easier. To shape the rolls, place your hands over the dough and press gently but firmly, cupping your fingers, rolling back and forth. While doing this, press the heel of your hands to leave some dough uncovered to form the traditional bolillo ears. Place each bolillo/roll seam side down on the greased baking sheet and cover with a greased plastic. Allow them to rise until they’ve doubled in volume. About 1 and 1/2 hour. At least 20 minutes before the end of the rising period, turn on your oven at 450 degrees F. Place the metallic pan for the water on the oven floor. Once the rolls have doubled in volume, and just before placing them inside the oven, make a deep cut using a sharp serrated knife or a razor blade, holding your hand at a 45-degree angle. The bread keeps well for a couple of days in a plastic bag, or it can be frozen for up to a month. To reheat: thaw bread lightly, spray water, and place in preheated 400 degrees F oven until crispy. About 12-15 minutes until warm and crunchy. • *If using active yeast, dissolve first with the water, mix well and let it proof for 5 minutes. • **Bread flour will render a finer texture. 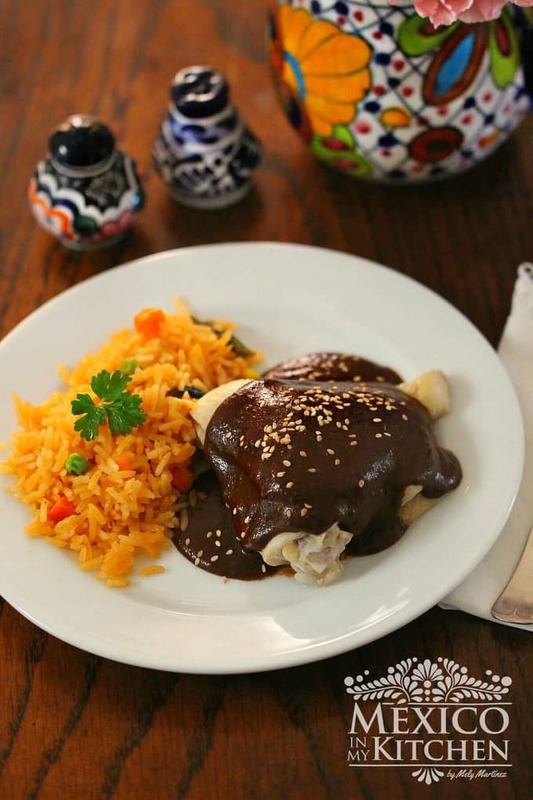 ***Traditional the bolillo recipe doesn't include shortening or any other sort of fat. But, I like to add it to preserve the softens of the bread for more days. • You will need a large baking sheet, a metallic pan to place in the oven with water, a spray water bottle, and plastic wrap. • I use a Baguette Pan for my bolillos, but a baking sheet or cookie sheet does the same job. • Baking with yeast requires time to let the dough rise. Plan your day ahead of time to get the best results. Please leave all your questions in the comments section, I will be happy to answer them. How to make Pozole Rojo. How to make Caldo de Pollo. Receta en Español Pan Francés. I usually don't put this type of bread into a plastic bag. It makes the crust soft too soon. This is because the bread steams into the bag and makes for high humidity. Don't you notice that most French breads sold in the store are in paper bags with one end open? Well, that's why. I would experiment a little using olive oil instead of shortening and a little lecithin. I know, you're trying to be authentic, but maybe if they had those ingredients back home, they would have made the bread different. A proposito, porque todos responden en espanol quando este pagina del web es en ingles? Hola disculpe como puedo agarrar esta receta en español?, si la hay, gracias! The bread looks great. Do you think I can use oil instead of shortening? Thank you for the recipe. 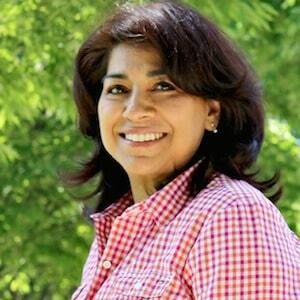 Your tamales recipe is fabulous! Yes, you can use oil either olive oil or vegetable oil. The reason why I add the shortening is to obtain a softer crumb since regular homestyle ovens bake the bread different than the ones at the bakeries. I have sourdough starter. Would your starter equal about a cup of starter? It will about 1 – 1/3 cup of sourdough starter. These are fantastic! I’ve cooked several of your recipes and they’ve all been phenomenal but this bolillo was what really motivated me to write a comment. Thank you so much for sharing and inspiring a love of cooking that I never knew I had in me! Thank you for visiting the blog. These Mexican bolillos are so good! I hope you try the recipe. I made them today actually! Combined with fresh refried beans my family and I had tortas de frijoles for lunch. Delicious! Great combination! 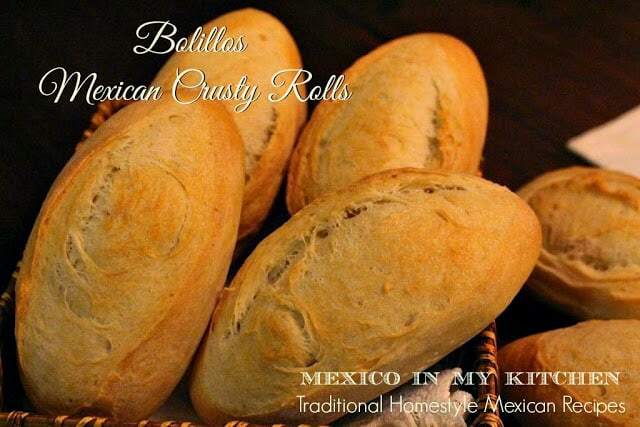 What a better pair than warm bolillos with refried beans. I have tried several recipes for bollilos and this is by far the best! 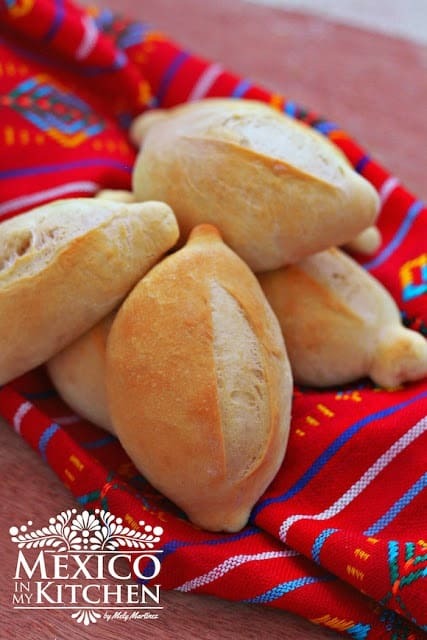 My father and I both fell in love with the bread when we visited Mexico last year. I try to make this regularly for him now as it is his favorite bread of all. Thank you for trying the recipe. So glad to know you like it. Happy baking! Any way you can post the weights as well. I find it a lot more accurate to get repeatable results. I cannot wait to try these (and them make tortas). I just added the weights. I hope you enjoy this recipe. Please, what is the weight of the flour? Cups just don’t work for me. I had updated the recipe adding the amount also in grams and ounces. Happy baking! You may not know this, but the changes don’t appear when you print the recipe! Thanks for a nice recipe, I am making it now as I write this. I’m sure they will remind me of Mexico, especially the first time I tasted a bolillo there – it was in a sidewalk café in the Zona Rosa and I was hooked on the bread and on the country. I ended up staying 20 years! Regarding my previous comment, I should have specified that though the weights appear on the recipe summary, when you click on Print you get a printout that doesn’t have them. You need to do the printing to see that. Thank you for letting me know. I tried the print option and it works fine, it includes the weight measurement this time. Please let me know if you still have problems. Thank you! I have been eating birote since the early 1950s. They were made with butter which you could clearly taste when you got to the bakery as soon as they came out of the oven. My Mom would buy bags full and freeze them. They tasted fresh baked when she defrosted them and wamed them up en the over. When I moved to Los Angeles in the early 1980s I found boillos. They look the birote but the crust was much thinner and the bread was not as dense as the birote. The thicker crust was made with a cornstarch and water glaze which kept the bread inside soft in times when freezer were not around. On a resent trip to Baja I went to the bakery my Tata bought his birote from. Because of the economy the butter was switched to a cheaper ingredient. I was so let down. That is why I have been looking for a recipe. My cousin tells me he has an authentic recipe. I will try yours to see if I get the density I’m looking for. Also I’ll be using butter to see how close I can get to the original. Great recipe. This was my second time making them. Thank you for all the photos, they really help.